Having enough money for retirement is a top concern for most Americans. 78% of Americans are “somewhat” or “extremely” concerned about not having enough savings for retirement, according to a recent survey by Northwestern Mutual. There’s good reason to worry. One in three Americans have less than $5,000 in savings, and one in five have no retirement savings at all. If you haven’t been contributing enough or just starting to save for your golden years, here are five retirement saving tips that will help improve your long-term financial prospects. Instead of simply saving and hoping for the best, figure out how much you will need for retirement and create a written financial plan that will get you there. There are a lot of free online budget tools that will help you track where your money is going each month. Examine your spending to see where you can cut expenses and contribute more to savings. 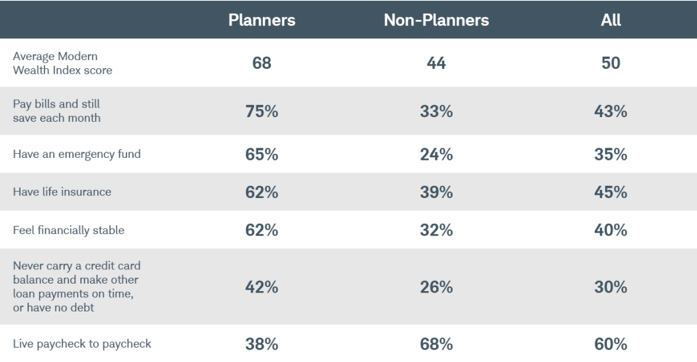 Schwab’s 2018 Modern Wealth Index showed that 75% of planners were able to pay their bills and save money, compared to just 33% of non-planners. Should you save for retirement or pay off debt first? 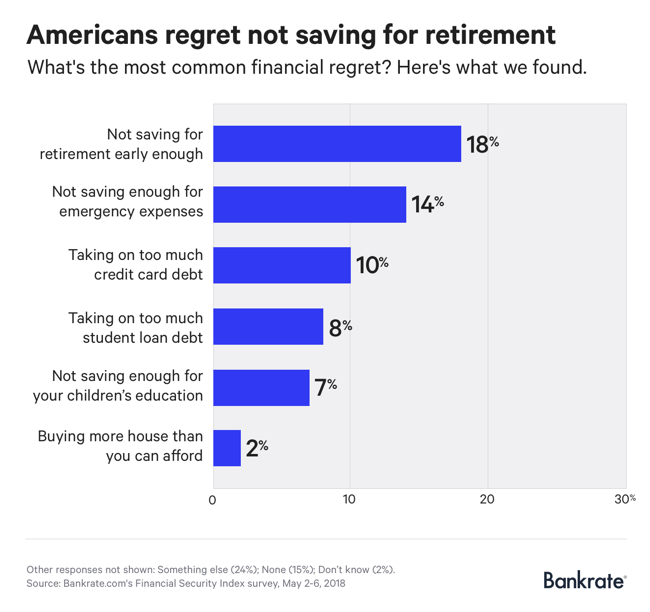 Not saving for retirement early enough is Americans’ biggest financial regret, according to a 2018 survey. Because of the way that compound interest works, delaying retirement for several years while you pay off debt could leave you with thousands less when you retire. For most people, the best option is taking a balanced approach. Contribute enough to your employer’s retirement plan to get the full matching contribution, put a little into an emergency savings account, and then pay off your debts concentrating on the highest interest ones first. Plan on contributing as much as you are allowed into tax-free accounts. In 2018, the annual contribution limit is $18,500 for 401(k), 403(b), most 457 plans, and the TSP, and $5,500 for traditional and Roth IRAs. If you are 50 or older, take advantage of catch-up contributions to save an additional $6,000 in your employer-sponsored plan and $1,000 in your IRA. Even if your employer doesn’t offer a 401(k) or other employer-sponsored retirement plan, you can open a traditional or Roth IRA on your own. If you are a freelancer, self-employed business owner, or have a side gig outside of your regular job, you can open a Simplified Employee Pension IRA, or SEP IRA. Limits are much higher for these plans- you can contribute as much as 20% of your income in a SEP IRA (up to $55,000). Not investing in the stock market was the third biggest financial regret of all Americans, and the top financial regret of men, according to a study by Go Banking Rates. Keeping your money in a savings account is not going to build enough wealth to last through retirement. A diversified retirement income strategy that includes a mix of stocks, bonds, and cash is the best bet. A financial advisor can help you determine the appropriate asset allocation mix based on your age, financial situation, and risk tolerance. The amount of money you get from Social Security is based on your earnings and the age at which you retire. That means that working a few more years or delaying when you start collecting can have a profound difference in your lifestyle. Every year you delay increases your benefits by approximately 8%, so delaying collecting from age 67 to 70 will leave you with benefits that are 24% bigger.Consider your retirement income needs to figure out the best time to retire and start collecting benefits. If you would like some more retirement savings tips or help creating a financial plan, reach out to skilled financial planner Matt Logan at www.MattLoganInc.com or call at 336-540-9700. We can review your finances and create a retirement savings plan that will allow you to enjoy a comfortable lifestyle in the future. Matt Logan is a Representative with Matt Logan Inc and Summit Brokerage and may be reached at http://www.mattloganinc.com/, 336-540-9700 or [email protected].